Since Ring of Honor and New Japan Pro Wrestling entered into a partnership in 2014, the two companies have come together semi-regularly to put on exciting joint “super”-shows, showcasing champions, top stars and up-and-coming talent from both companies. This year’s first show, Honor Rising in Japan, took place this past Sunday and Monday mornings, and was no exception. There were loads of great matches—both main events, the tag matches, anything involving Dalton Castle—and both days are worth watching. And the fallout could be even more interesting than the shows themselves. Here are five takeaways from Honor Rising 2017. New Japan fans haven’t seen Kenny Omega since his masterpiece against Kazuchika Okada at Wrestle Kingdom 11 in January. In that time, there was plenty of speculation on Omega: Had he already resigned with New Japan after his contract ended? Would he sign with WWE to appear in the Royal Rumble? In the meantime, New Japan focused on a feud between Okada’s Chaos and new signees Suzuki-gun. So when Omega—and the rest of the Bullet Club—returned at Honor Rising, the crowd was over the moon. New Japan fans showered him with babyface love as the company’s top gaijin walked to the ring, too-sweeting everyone along the way. The audience even went as far as to boo company ace Okada in their six-man tag match Monday. At this point, Omega’s talents are well established, but after watching the product both with and without him the last two months, it was a stark reminder as to why Omega will play a crucial role in New Japan’s immediate future. When Cody Rhodes was announced as the newest member of the Bullet Club via video package toward the end of 2016, it wasn’t clear if the largely silent Japanese audience didn’t know or didn’t care about the American star. When Wrestle Kingdom came around 11, and after a strong match with Juice Robinson, the dulled sounds of the Tokyo Dome made it tough to tell. But at Honor Rising, in front of the Korakuen Hall crowd, it was obvious: Cody had arrived. Outside of Kenny Omega and maybe Adam Cole, reactions for Cody were some of the most boisterous of the weekend. It’s a good thing, too, because it appears his future there is already mapped out: They’ve already set up an inevitable Cody vs. Shibata match for Cody’s “list,” and with his apparent popularity, he could play a role in what looks like the coming power vacuum at the top of the Bullet Club’s ranks. Perhaps most importantly: His work seems to fit in better with the New Japan roster than it does on the indies more generally, and if he does put in more time in New Japan, he could make a serious impact. War Machine was a surprising bright spot in last year’s World Tag League, winning a respectable eight points in the round robin tournament and, more importantly, winning over an unfamiliar Japanese audience. Their return at Honor Rising cemented them as one of the best tag teams in New Japan’s heavyweight division. 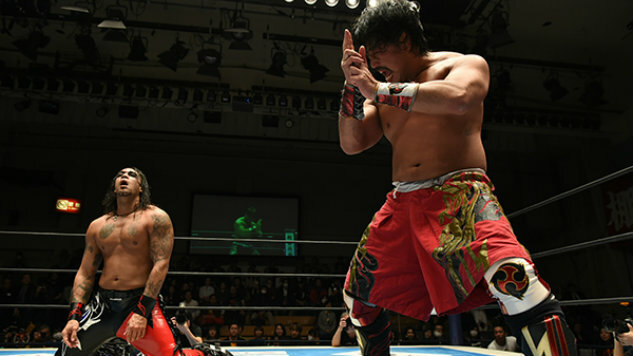 The two men faced off against both the Young Bucks and World Tag League semifinalists Guerillas of Destiny, in two of the better matches on each show. Their match against G.o.D. was especially impressive: without the flash of the Young Bucks, Hanson and Raymond Rowe were able to shine in just under 10 minutes of power-vs.power tag action. The two men even took to the microphone, cutting a believable promo about the IWGP Heavyweight Tag Team Championships to a cheering crowd. It’s unclear how much time War Machine will spend in Japan going forward, but New Japan could have the fix to their struggling heavyweight tag division. One of the more surprising aspects of Honor Rising was the opportunity it presented for Ring of Honor to push the 2016 Top Prospect Tournament semifinalist Punishment Martinez. I haven’t seen much from Martinez, outside of a stray match here or there. But in Japan, Martinez was center stage, getting a big win over a major ROH star, disrespecting New Japan’s biggest faction Los Ingobernables de Japon, and taking on NEVER Openweight champion Hirooki Goto on the second half of Monday’s card. Martinez may look a bit like a videogame Create-a-Wrestler, but at Korakuen Hall he proved he could hang in the ring with anyone. The move to feature him so prominently during Honor Rising could be a sign that ROH wants to turn him into a key player on their programming. And after seeing his performance, it’s not such a crazy idea. In mainstream pro wrestling, attitudes, actions and characters that don’t read as “heterosexual” are often played to get heat. Goldust’s original incarnation was a heel meant to sow gay panic in the then-WWF. In 1997, Jerry Lawler called Goldust a “flaming fag” before one of their matches, and when, in an interview, Goldust clarified that he wasn’t gay, it was meant as his big babyface turn. It was, shall we say, a less enlightened time—but not by much. Which is why some of what’s happening in New Japan and ROH is so refreshing. The sexuality of Dalton Castle has long been ambiguous—in an interview with Jim Ross, Castle said he knows the character’s sexuality, but won’t reveal it—and he’s consistently one of the most over wrestlers on any card. At this year’s Honor Rising shows, he got Ryusuke Taguchi, Hiroshi Tanahashi and two young lions in on the action, dressing them up as his scantily clad “Boys,” doing things like caressing their faces after they disrobed him in the ring, and bumping crotches with Taguchi in a pre-match spot. Speaking of Taguchi, his feud with Hiromu Takahashi has nearly drifted into a kissing match, with the two men approaching each other, tongues fully out in some sort of sexual game of chicken. Even Silas Young’s “last real man” character seems largely ironic. It’s refreshing to see a wrestling show where mainstream ideas of “manliness” don’t always apply, and in fact, can be played for laughs themselves.